APSSA, Amaravati - Pedagogy - 72th Independence Day Celebrations in all schools - Conduct of competitions for the students across all Primary & Upper Primary Schools including KGBVs in all managements in the Andhra Pradesh - Instructions - Issued. 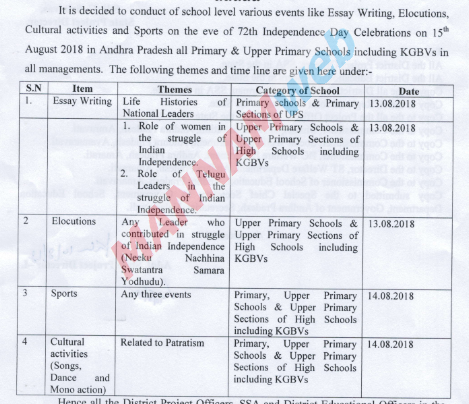 Sub:- APSSA- Amaravati- Pedagogy - 72th Independence Day Celebrations in all schools - Conduct of competitions for the students across all Primary & Upper Primary Schools including KGBVs in all managements in the Andhra Pradesh - Instructions - Issued. Ref:- Govt. Memo No. 302/Pro.B/2018-19, dt.27.07.2018. Hence all the District Project Officers, SSA and District Educational Officers in the State are informed that, to conduct the above said events in all Primary & Upper Primary Schools including KGBVs in all managements regarding the eve of the 72th Independence Day Celebrations on 15th August 2018 in Andhra Pradesh. Further the District Educational Officers & Project Officers of APSSA in the state-are instructed to give suitable instructions to the field level concerned Officers to conduct said events and independence celebrations at schools level without fail, after conduct of the above said events to select the top three places and the same should appreciated with certificate. Further all the schools shall be celebrate Independence Day on 15.08.2018 by involving all the students, staff and School Management Committee along with parent community and distribute the certificates to the students who stood top three places on the said above events and make it grand success. The expenditure should be met in available funds at school level.